Providing the East Houston area with professional, fast and eco-friendly junk removal services. 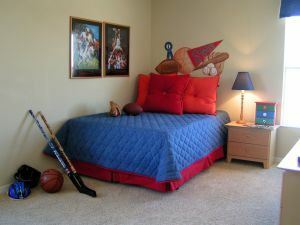 With the kids established in their new back to school routines, you’ve got the opportunity to take stock of the house. A lot could have happened over the summer in terms of the kids growing up and out of their clothes. Usually around the time that hit the pre-teen years their bedroom starts to evolve from a toddler playground to a teen cave. If you’re in the middle of that type of transition then you’ll be swapping out furniture. It’s time to get rid of the bunk beds and bring in a desk. This is also the perfect opportunity to clear out all the clutter from your kid’s room with a little help from Junk King. Junk King is a professional junk removal service that will provide you with a two-man moving crew to haul away all your unwanted items. This means all you kid has to do is decide what they can live without and then leave it for Junk King. Won’t they be happy that they don’t have to do any of the actual heavy lifting! While the kids are going through their room sorting out the clutter, you can do the same thing in the rest of the house. Not only will you have that two-member Junk King crew but you’ll also have a huge truck to fill up with as much junk as you want. This is the time to get rid of all the musty furniture in the basement and boxes of rubbish out in the garage. The cleanout doesn’t have to stop at the inside of your house. Junk King can also go around your yard to take away other items your kids have outgrown. This could be taking apart a swing set, tree fort or sand box. The Junk King crew will have the tools and the skills to handle any type of dismantling job. Everything that you’ll be tossing out will be sorted by the Junk King crew. They’re going to pick out the items that can be donated or recycled. This is part of their aggressive green business philosophy. If Junk King can keep something out of a local landfill, they will! This means all that toddler furniture and toys will find its way to a charity where it can help another family. If you want junk removal done right, then you need to hire Junk King. This entry was posted in Pasadena TX Junk Removal Services – Back To School 2014 and tagged back to school, Junk King, junk removal on September 30, 2014 by Jose Urdaneta. Last updated August 1, 2017 . What’s In Your East Houston Garage?